Folding RV assist rail provides steady support and convenience as you go up the stairs or down the road! 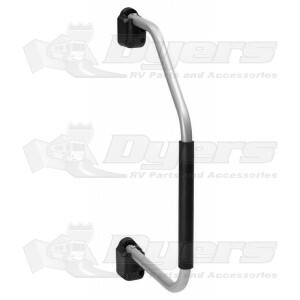 The Lend-a-Hand RV rail provides steady support and convenience, as you go up the stairs or down the road. Folds and locks to the side of your RV for travel without any tools. Locks open to make entering or exiting your RV easier. No tools required for locking rail in open or closed positions. Mounting bracket is designed for left hand mounting applications.